Verdi’s penultimate opera is both a supreme masterpiece and the greatest killer of tenors in the Italian repertory. 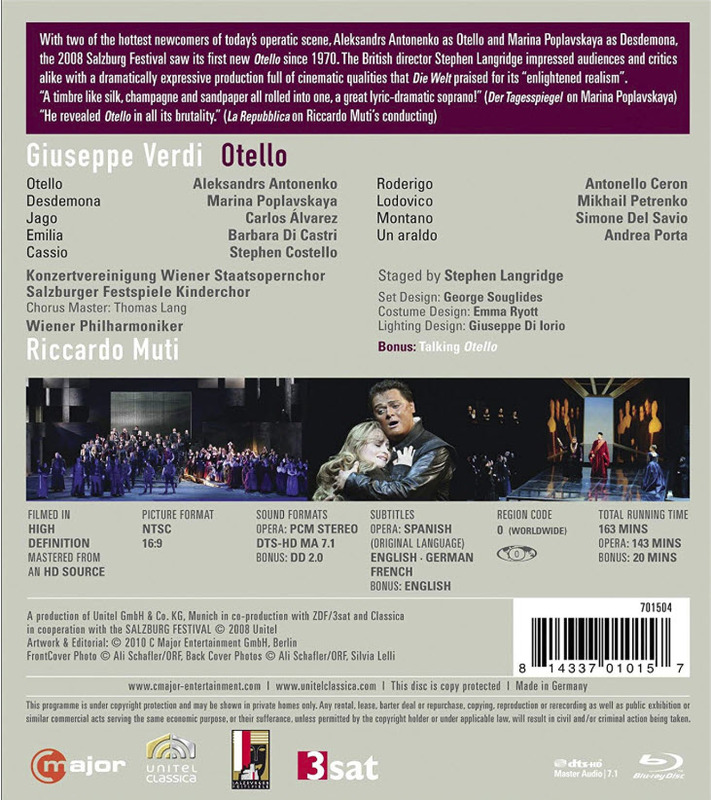 I’ve written enough about the merits of this opera on these pages to allow me to concentrate solely on the video disc that is part of Parma’s survey of all Verdi’s operas and on Latvian tenor Aleksandrs Antoņenko who had his first go as Otello in this production. Actually, this mounting had nothing to do with Parma other than being included in its Verdi album. It’s from the 2008 Salzburg Festival with the Vienna Philharmonic in the pit under Riccardo Muti’s direction. As you can hear the tenor’s rendition in Salzburg was focused and not forced – an excellent reading. But just seven years later when he was only 40 years old his sound is ponderous, wobbles, and he strains for the higher notes. The obvious moral is think carefully before you add Otello to your repertoire. The Desdemona in this recording, Marina Poplavskaya, had a meteoric rise in the operatic world and an equally precipitous fall. Only 30 years old at the time of this performance, hers is the finest portrayal among a group of outstanding singing actors. She vividly projects the love, pathos, fear, and stubbornness inherent in the doomed soprano. Why doesn’t she give her pleas for Cassio a rest after she’s seen how much these requests for mercy drive her deranged husband even further to the side of madness? Vocally her sound was rich and vividly offered from the softest passages to her explosion as Emilia is about to leave her bedroom in the last act. Sadly she no longer sings. Her voice became troubled in 2010 and she stopped appearing in 2014. Apparently, she now make her living as a realtor in Manhattan. The Spanish baritone Carlos Álvarez was appropriately unctuous and malevolent as the action required. Iago needs more acting than many other Verdi baritone roles. It also is written lower than most of the master’s baritone parts. It can be sung by a bass-baritone. Álvarez’s striking impersonation dominated much of the action, as it should. Tenor Stephen Costello was just getting started when this show ran. The following year he won the Richard Tucker Award and has been regularly singing leading lyric roles at the Met since. It’s hard to make a big impression as Cassio. Costello did about as much as can be done with the role.The rest of the cast was also fine. Conductor Riccardo Muti is especially renowned for his affinity for Verdi. In general, his direction was forcefull and effective. Having the Vienna Philharmonic in the pit is a luxury that most opera companies can’t afford. Muti led a taut and exciting performance. My only complaint is that the great ensemble at the conclusion of Act 3 seemed unfocused – at least in its first half. Otello doesn’t need a lot of help from the sets and costumes. Designer George Souglides had a spare approach to the opera. His set was dominated by a large table/platform that split in two after Otello’s collapse in Act 3. The costumes were time appropriate, low key, and didn’t distract from the action. There are two problem with this disc. Much of the dialogue is not translated. The English subtitles are just inadequate. If you don’t know the opera you may miss a lot of what’s going on because of this flaw. Also, video director Peter Schöhofer is addicted to sweaty close ups that are very distracting. They also make a lot of the action difficult to follow. So, is the disc competitive with its competition? In general, I’d say yes. But I don’t think it the equal of the Met’s 1995 video featuring Domingo as Otello under James Levine’s direction. However, this is an opera that warrants more than one recording. ” tenor’s rendition in Salzburg was focused and not forced – an excellent reading.” I disagree. I found him awkward.